Transparency International recently launched a report on corruption in the forestry sector. Dede Kunaifi, Research Assistant in the Riau Forestry Unit of TI Indonesia, and Claire Martin, Programme Coordinator of the PAC REDD Project, talk about what happens when competing interests for land collide. A farmer from Pulau Padang stitching his mouth shut to protest unanswered requests about why a protected forest that the farmers owned has been awarded to a large paper company. Stitching their mouths shut is one of the more drastic of a series of actions that are being taken by people from Pulau Padang in Indonesia after requests from them for an explanation for the award of a new paper concession to PT RAPP (Riau Andalan Pulp and Paper-APRIL Group) went unanswered. As can be seen from the map below, this concession – indicated by red lines – was awarded on an area of protected forest – indicated by the dark green colour. Controversy has raged since 2009 when this concession was first awarded with communities expressing grave concern that a significant portion of land that they traditionally owned was included in the 41,205 hectare concession. PT RAPP has been criticized before for its failure to engage with and consult communities. 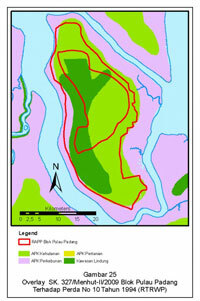 Map of PT RAPP (APRIL) concession that was awarded on an area of protected forest. In a recent study undertaken by TI Indonesia, corruption risks in the forestry sector in Riau were outlined. In particular, there is considerable vulnerability to fraud in the process of granting concession permits. A 10 year process of preparing a new spatial plan for Riau Province which would narrow the scope for illegal maneuvers is still ongoing. Hampered by problems of too many overlapping interests and conflicts among institutions, those relying on the land are beginning to lose all hope for change. Most of all they fear loss of critical land and forest access through a process of concession allocation which ignores their interests and which proceeds without any transparency. The environmental impacts of the concession on the peat area could threaten the community's livelihood. A Ministerial Decree in 2009 awarded PT RAPP (APRIL) a concession permit for a parcel of land in Pulau Padang with an area of 41,205 Ha. Pulau Padang residents immediately became fearful of losing access to their forest and land. The majority of residents are farmers who cultivate crops, rubber and sago and their existence is now threatened by the issuance of this concession permit. The potential impacts are even broader with fears being expressed by communities of the potential environmental impact on the peat area with residents recalling the case of Sebangau, Central Kalimantan. They fear company operations could cause extensive destruction of the peat area causing major loss to the people who live around the peat forest, as well as threats of floods in the rainy season and fire during the dry season. The community organised a rally which was attended by over 800 people. Other actions taken by the community to express their dissatisfaction included a rally held on May 30, 2011, which attracted over 800 people from villages such as Lukit, Meranti Bunting, Pelantai, Mekarsari, Teluk Belitung, Bagan melibur, Mengkirau, and Tj.Padang, predominantly farming communities. Tensions continue to run high in the area, and tragically, in July 2011 heavy equipment working to clear land within the concession area was set alight, and the vehicle operator was killed. The unilateral agreement between government at village, district and provincial level regarding the award of the operation has therefore led to much suffering in Pulau Padang. The people of Pulau Padang are calling for their voice to be heard and for transparency in terms of how the award process proceeded. On November 2nd 2011, they went to A Commission and B Commission of Riau House of Representatives, to demand the council make representations to the Forestry Minister to stop the operation of PT RAPP on Pulau Padang. Like residents of Teluk Meranti before them, the people of Pulau Padang want the permit reviewed. 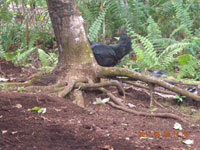 As an area of predominantly deep Peat Forest, they feel strongly that it should be protected by Presidential Decree No. 32 year 1990 and also the National Spatial Plan (RTRWN). The hunger of the paper industry in Indonesia for land and forest to expand their operations seems to be insatiable. Huge market demand supported by competitive prices has led to a rapid growth of the pulp and paper industry in Indonesia. Despite previous regulations to the contrary in the form of a Forestry Ministry Decree from 2004, the Indonesian Government no longer prohibits the use of natural wood for pulp and paper and this is being taken advantage of in this concession. The limits of the land and the forests are all quickly being reached. Without regulations to rely on as well as clear and transparent enforcement of these, the future is looking bleak. The people of Pulau Padang will continue to call for their voices to be heard and Transparency International Indonesia’s Forestry unit in Riau will support their actions to bring about positive change. As REDD begins to take shape in Indonesia, we will also work with communities through the PAC REDD project to ensure they are able to fully participate in the process and that accountability plays a stronger role.